PRINCETON, N.J., June 25 /PRNewswire/ -- MimoMonitors.com once again raises the bar in the USB-driven mini-monitor industry with today's announced availability of the long-awaited iMo Monster 10" Touchscreen Monitor among their line of products available at www.mimomonitors.com. Now the largest in the submonitor class, the iMo Monster stretches the screen real estate from the previous standard of 7 inches to a full 10.1 inches of display area, while also adding new features and upgrades. Easily portable with a fold out stand for tablet style use or mounting, the iMo Monster is only 1-inch thick, weighs just 1.77 lbs. and features a best-in-class 1024 x 600 resolution – offering sharp graphics and clear images for video, graphics, and a full range of business applications. 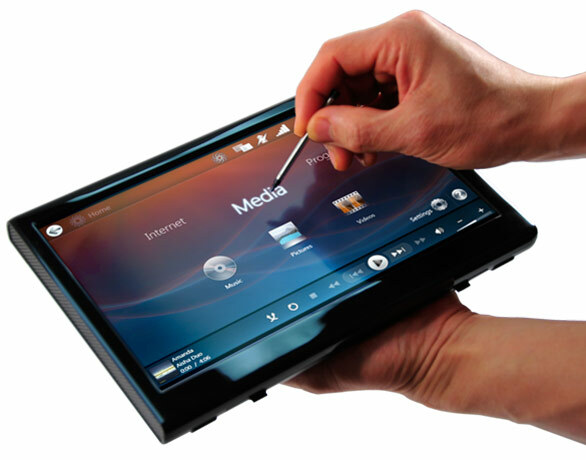 With full touchscreen capabilities, the 10" Monster is ideal for Point-of-Sale (POS) data input, signature capture, educational software, Photoshop tool palettes – as well as providing the versatility for use in health care, hospitality, retail, education, sound/video editing, and other industries. Supporting both Windows and Mac OSX operating systems, the Monster allows users to de-clutter their crowded, primary desktop monitor and offload applications such as web browsers, Microsoft Outlook, Excel, and Word, plus social networking platforms like Tweetdeck, media players, chat windows, and more. Like all Mimo and iMo monitors, the Monster requires just a single USB 2.0 connection for both connectivity and power – meaning no extra VGA cables or video cards. The Monster also features a built-in stylus for touchscreen use, two additional USB input ports, 4.5-inch USB cord, Kensington lock compatibility, and is EnergyStar certified. Available today at www.mimomonitors.com, the iMo Monster is priced at $259.99 plus shipping. For more product information, visit http://www.mimomonitors.com/products/imo-monster-touch-10-inch-mini-usb-touchscreen-monitor.